Star Wars fans have been spoiled recently, with four films released in the last three years. Inevitably kids and adults alike want to grab models of the best parts of the movies. 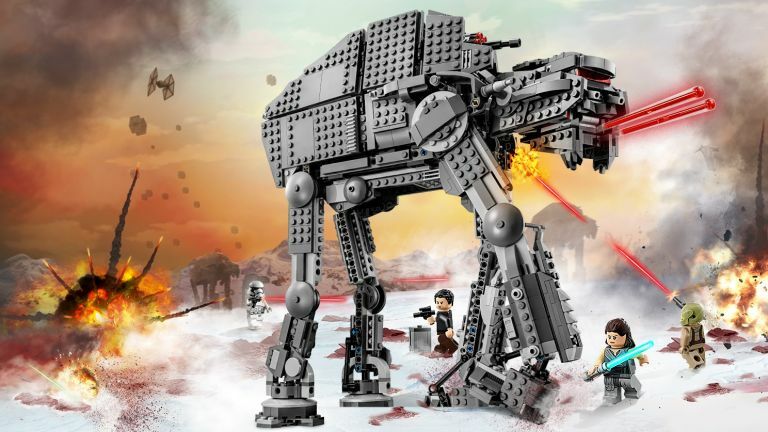 Luckily everyone’s favourite toy company, Lego, has teamed up with everyone’s favourite galaxy far, far away franchise to bring us a huge range of Lego sets created to suit all kinds of budgets. From the cheap and cheerful under £20 to eye-wateringly huge sets that’ll keep you occupied for days - if not weeks. The secret to picking the right set for you is finding one that’s in your budget, at the age level you’re buying for - whether it’s you or someone else - and from a movie that’s a firm favourite. It’s also worth considering if you want to buy a set for the building, the fun and the playing experience or the building, the displaying and the looking damn good on your desk experience. For example, the BB-8 set below has a display stand for that exact reason - and to stop it rolling around too, of course. We’ve collected together some of our favourite Star Wars Lego sets, from those that have just been released to celebrate The Last Jedi, through to sets that recreate the most iconic scenes from the earlier movies, like the Desert Skiff escape, or events from the animated series, like Yoda’s Jedi Starfighter from Clone Wars. So whatever your budget or tastes, we can guarantee that yes, these ARE the Lego sets you’re looking for. Plus, lots of Star Wars sets will probably have discounts after Christmas, so keep your eyes out on our best Boxing Day sales page. Give yourself to The Dark Side with one of the biggest sets of the bunch. This monumental Star Destroyer boasts 1,400 pieces along with five minifigures. These are brand spanking new from The Last Jedi, so include an exclusive Supreme Leader Snoke, a First Order Officer, a First Order Stormtrooper Sergeant, a First Order Stormtrooper and a First Order Shuttle Pilot. But don’t worry, there are two droids thrown into the mix too to keep the First Order’s operations running smoothly, including the BB-9E and a Medical Droid. Given its super stellar size, there’s a carry handle on the side of the Star Destroyer, which is good for moving it around, but also pretending to zoom it through hyperspace. Its detailing looks as realistic as it can considering it’s made from Lego, with armour-panel features and 8 firing stud shooters, as well as rear engine detailing on the back of the ship. Although it’d make a great display model, its opening panels ensure it’s ideal for play too. You can close them to see the detailed Star Destroyer’s exterior or open them up to reveal an interior packed with the inner workings of a First Order capital ship. There’s a working elevator to take you to Snoke’s chamber, a bridge with seats for all of the crew, a conference space and a passage that leads through to a control room with plenty of interface detailing. We just feel sorry for whoever you encounter once your Star Destroyer is up-and-running, because we hear the odds of successfully surviving an attack aren’t that good. During The Clone Wars animated series, the wise Jedi Grand Master Yoda uses this small yet sturdy Starfighter ship to go on missions to Dagobah, the swampy planet he lived on when he was exiled after the destruction of the Jedi Order. For those who haven’t delved into The Clone Wars animated series (sidenote: you really should) you may best know Dagobah from as the place where he first trained Luke Skywalker in the ways of The Force. The Jedi Starfighter Lego set has folding wings on its the sides, an opening cockpit in the middle for the Yoda minifigure to fit into, as well as space for his side-kick during his missions, the near-sighted scrap pile, R2-D2. The ship also packs a punch when it comes to weaponry, with two laser cannons, as well as spring-loaded shooters. But if that’s not enough, Yoda does have his own lightsaber with him too if he needs to fight off any Dark Lords. The Lego website suggests the Yoda Jedi Starfighter set is best for those aged between 8 and 12, but we’re pretty sure even adult fans of the small yet mighty Jedi master will enjoy this fairly simple and affordable starship set too. The BB-series astromech droid from The Force Awakens is here to become your new sidekick, friend and memory drive safekeeper. Created for Lego lovers aged between 10 and 16, the BB-8 model has more than 1,100 pieces and measures 9” high and 5” wide once it’s fully constructed. Unlike the BB-8 of the movies, it doesn’t have a selenium drive or a thermal hyperscan vindicator, but if you turn the wheel at its side you can rotate BB-8’s detailed head. And another will open the access hatch and extend a fake welding torch, just like in the movies. With a sturdy display stand, fact plaque to go alongside the model and a teeny tiny BB-8 minifigure to boot, this BB-8 is geared up to be a display model for your office or bedroom more than anything else. But that doesn’t mean you can’t ditch the plaque and the extras if you want to add it to the rest of your Star Wars toys, it’s just a lot bigger than the usual minifigures - you have been warned. Looking for the best toy gifts for children this holiday season? Although you may have seen similar combat walkers throughout Star Wars movies and TV shows, this one is based on the walker seen in the new movie, The Last Jedi. It features tough, armour-plated detailing on its sides, as well as both posable legs and a poseable head. You can put minifigures into it via an opening in its head, which is where the cockpit is located. In terms of weaponry, the Heavy Assault Walker has spring-loaded shooters, an aimable rapid-fire stud shooter on the top and detachable canisters that you’ll find at the rear of the combat walker. There’s also a space at the side for extra ammo and another at the back for yet another minifigure and extra missile ammo. You’ll get your hands on some The Last Jedi minifigure character favourites with this combat walker, including Captain Poe Dameron, Rey (who comes with her own lightsaber), a Resistance Trooper, a First Order Walker Driver and a First Order Stormtrooper, all of which are packing their own blasters. Measuring more than over 13” high and retailing at more than £100, the Heavy Assault Walker is definitely a purchase for those serious about their Star Wars toys who are looking for a Lego creating challenge rather than a walk in the park. When you think of Lego characters you often think of small minifigures, but the brand does create larger versions of important characters too, like everyone’s favourite Wookie. The Chewbacca model is buildable and should be easy enough for ages 8 and above. Once he’s completed he’s pretty big at more than 11” tall - bigger than some of the other big, posable figures, which is cool because it’s movie accurate. Chewie is also highly-posable and durable, meaning he can play with different characters and toys from different brands easily without breaking into bits like some other Lego models. But we’re not feeling too confident about anyone who put him up against, after all we all know that it’s not wise to upset a Wookie. He has a removable belt that contains ammo, as well as a bag. Weapon-wise, he’s carrying a bowcaster weapon with a spring-loaded shooter and lots of extra ammo. This impressive Resistance Bomber would make a brilliant display model for collectors because it looks so damn good once it’s completed, but it also has a bunch of great play features. These include a button-activated bomb release function, just drop the bombs in the top and press to fire! There’s also spring-loaded shooters on-board and 2 rear gun turrets that open up with space to put in a minifigure to operate them. But that’s not all, there are also elevating rear guns and a front cockpit that can fit 2 minifigures under a detachable canopy, as well as a removable top section to give you easy access when you’re playing and in the middle of destroying the First Order. As you’d expect from a battle spacecraft that’s featured in The Last Jedi, fans will be excited to see some really great minifigures in this set, including Poe Dameron (complete with a blaster pistol), Vice Admiral Holdo, Resistance Gunner Paige, a Resistance Bomber Pilot and a Resistance Bombardier. It’s admittedly an expensive set, but most online reviewers agree that with such a huge range of features, some great minifigures and a good-looking final result, this Resistance spacecraft really is worth every penny. Before you look at the price of this brand new Millennium Falcon model (did you look? Are your eyes watering yet?) let us tell you why it’s so damn special. There have been a few Lego iterations of the iconic light freighter in the past, but this one beats them all in every respect. For starters, it consists of 7,500 pieces, which makes it not only the biggest and most detailed Millennium Falcon model ever, but also one of the biggest Lego models you can buy too. As you’d expect from such an intricate build, this version of Han Solo’s unforgettable Corellian freighter has a huge range of features that fans both old and new will love, including upper and lower quad laser cannons, lowering boarding ramp, landing legs, and a cockpit that can fit 4 minifigures with a detachable canopy. Although at more than £600 many of us would be scared to touch it again and keep the Millennium Falcon as a display model (utilising the fact plaque that comes with it), you can remove individual hull plates in order to see what’s inside. There’s the main hold with a seating area, rear compartment with an engine room, escape pod hatches and engineering console, as well as the gunnery station underneath, all of which you can play with just like you would with any other, normal-priced spacecraft. There’s a huge range of minifigures, appealing to both old and new fans. First up, there are 4 classic crew minifigures included in the Millennium Falcon set: Han Solo, Chewbacca, Princess Leia and C-3PO. But there’s also 3 crew minifigures from The Last Jedi too: Older Han Solo, Rey and Finn along with their respective weapons. There’s also a BB-8 droid, 2 buildable Porgs and a buildable Mynock too. What better way to battle the forces of the First Order than with Poe’s super slick-looking X-Wing Fighter? Poe’s distinctive X-Wing spacecraft comes with a bunch of great features. In terms of weapons, it includes 4 spring-loaded shooters and 2 stud shooters along with a weapon rack, missiles, ammunition. It also has retractable landing tech, wings that open up and a cockpit that fully opens too, so you can put a minifigure in there to captain the craft. And last but not least, there’s also space behind your fighter pilot, which is likely to always be Poe, where you can fit your BB-8 droid. The three minifigures included with the set are, as you’d expect, Poe Dameron and his BB-8 BFF. But there’s also Resistance ground crew and a Resistance X-Wing Pilot too in case Poe needs a break, as well as 2 blaster pistols and a wrench for emergency repairs. If the idea of being Poe Dameron and battling the First Order just doesn’t appeal to you, then maybe you’re more of a Kylo than a Poe. Feed your inner Dark Side with Kylo Ren’s ship instead, with this dark, brilliant and kinda terrifying TIE Fighter. It consists of large wings, red detailing, an opening cockpit and 2 very cool, trigger-activated spring-loaded shooters. All of the pieces are easy-to-build with some patience and are aimed at those aged 8 and up. Once you’re done constructing, the TIE Fighter should stand at 4” wide and it’s 16” long. The TIE Fighter comes with three minifigures, including Kylo Ren, a First Order TIE Pilot and a First Order Stormtrooper, plus a BB-9E droid. There’s also Kylo Ren’s lightsaber, a blaster and a blaster pistol to choose from if you want your characters to fight on the ground instead of in the air. Online reviewers said it’s a great ship for ‘playability’ for all kinds of reasons, one of the biggest being that it’s surprisingly light so can be picked up and flown through the starry sky into battle with an unsuspecting Resistance ship with ease. If this combat walker looks different to you, that’s because it is compared to a lot that have come before it. That in itself is really exciting for all Star Wars fans - a brand new assault vehicle specially designed for The Last Jedi. What’s less exciting and more kinda scary is it has 8 legs and almost scuttles around like a spider. Urgh. Aimed at those aged 9 to 14, the build is a little more involved than some of the other kits on the list, but online reviewers say it just took patience rather than a huge amount of skill so it should be fine for most kids. The First Order Heavy Scout Walker features a with an opening top hatch that can fit 2 minifigures into it. Weapons-wise, there are elevating spring-loaded shooters at both sides, as well as elevating guns at the front and missile storage clips. To get that scuttling effect we mentioned above, there are hidden wheels underneath the finished model, in order to make it look like it’s crawling along the ground. All you have to do is push it, the wheels set in motion and the legs start to move. The set includes 4 minifigures: General Hux, a First Order Gunner, a Resistance Trooper and a First Order Flametrooper. There are a few weapons you can choose to arm each with, including 2 blaster pistols, a blaster and the Flametrooper's flamethrower. If you’re a fan of Rey after watching The Force Awakens, then you need her and her speeder. This set is great for those who love Rey but would also make a great present if you’re looking for an idea for a Star Wars fan but don’t have a lot of money to play with - steer clear of the Millennium Falcon, whatever you do! The landspeeder is packed with everything Rey needs - and it should be, she made it herself from scavenged parts from Jakku. It has dual stud shooters and a storage hatch that can open up. The set also comes with a bag, blaster, buzzsaw and electrobinoculars. What else does a scavenger on a desert planet need, right? Well, maybe one more thing. A sled! The landspeeder set comes with a detachable sled that Rey can use if she wants to make a breezy escape down some sand dunes. The speeder doesn’t just come with Rey, but also includes Unkar’s Thug so you can practice speeding away from him across the desert. Featuring minifigures of The Force Awakens favourite Finn and brand new character Rose, this is a Resistance Transport Pod to help members of the Resistance make a quick escape. It has a cockpit that fits both of the minifigures and fully opens up with a removable canopy. There are also detachable elements at the rear of the model for storage of weaponry, as well as the BB-8 figure that also comes with it - no ship is complete without a droid on-board, right? When it comes to weapons, the Transport Pod includes a stud shooter on the side, which you can easily aim by moving the rear engine. There are also dual spring-loaded shooters underneath as well. Both characters have their own weapons at hand in case they come into contact with any of the First Order face-to-face, including Finn’s blaster, Rose’s shock gun, as well as a blaster pistol. The set features a lot of stickers, so it’s ideal for those who love building worlds and interfaces beyond just the basic bricks - but probably not so great who don’t like fiddly things. Boba Fett? Boba Fett?? Where?! This Lego model is a recreation of one of the most iconic scenes in the whole of the Star Wars saga, the Desert Skiff Escape, just before the good guys are about to be put to their death into the mighty Sarlacc’s mouth by Jabba The Hutt. The set includes all the best elements of the scene, including Jabba’s skiff, which has its own extendable plank, as well as movable rudders and a storage hold and the Sarlacc’s mouth, teeth and weird tentacle thingies. Eughh. You can play duels on the dunes with a selection of minifigures, including Han Solo with his blaster pistol, Chewbacca, Boba Fett with a special blaster, as well as an axe, and a Skiff Guard. Just like the larger than usual Chewbacca figure, this buildable, poseable and really sturdy Rey is great for those who want to include the newbie Jedi in their play with other toys, rather than just including her in a Lego set. She comes with a lot of great detailing that’s new for 2017 and the release of The Last Jedi, like textile patterns, chest and arms decoration. She also has a brilliant blue lightsaber, a blaster pistol and a very cool, wheel-activated battle function that sees her swinging her arm - and wielding her lightsaber. If you loved Return of the Jedi you’re going to instantly recognise this set, because it’s based on the iconic Speeder Bike’s the Imperial forces used on the forest moon of Endor. Like the Rey and Chewbacca models we’ve also added to this list, you’ll see that the Scout Trooper isn’t just a small minifigure, it’s buildable, highly poseable and stands at 9” high. It also has a pouch, a bag, the iconic Scout Trooper helmet, as well as a blaster pistol. The Lego brick recreation of the Speeder Bike has a spring-loaded shooter, footrests, handlebar and a handle underneath that either makes it easier to play with the Speeder Bike as you whizz past Ewoks or display the model if you’re more into building and collecting than playing.